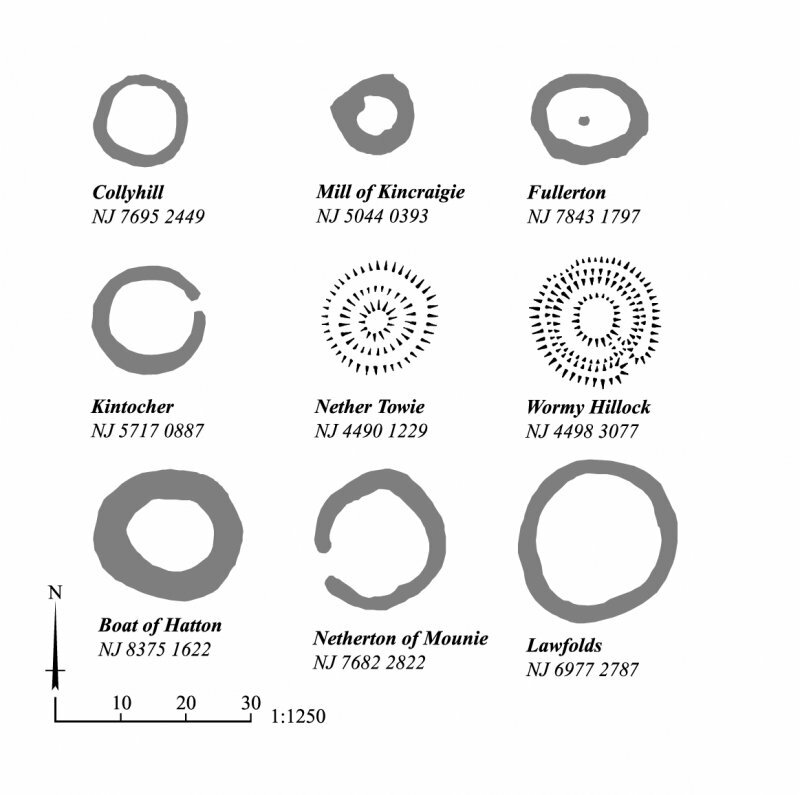 A plan of a selection of ring-ditches identified from cropmarks and two comparable enclosures with external banks recorded at Nether Towie and Wormy Hillock. 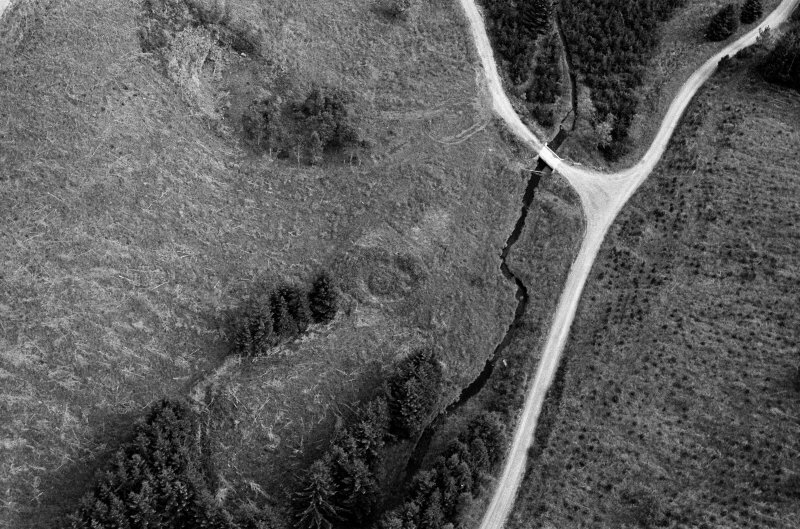 Oblique aerial view centred on the remains of the henge at Wormy Hillock, looking to the NE. 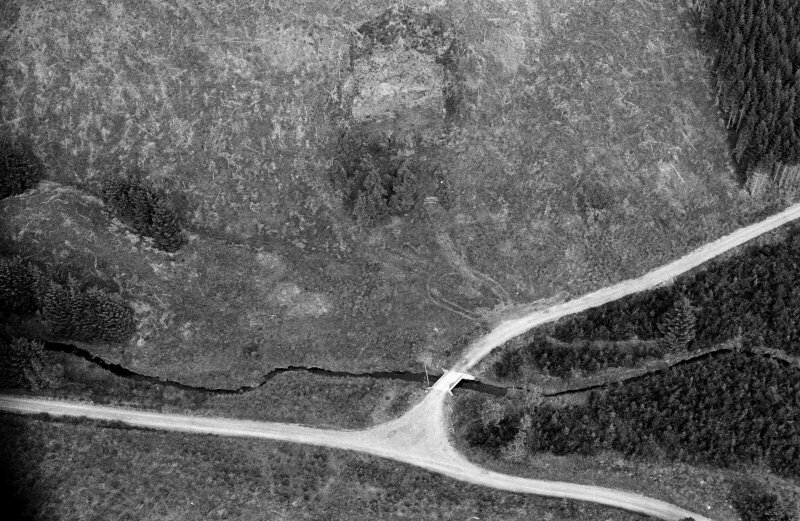 Oblique aerial view centred on the remains of the henge at Wormy Hillock, looking to the ESE. 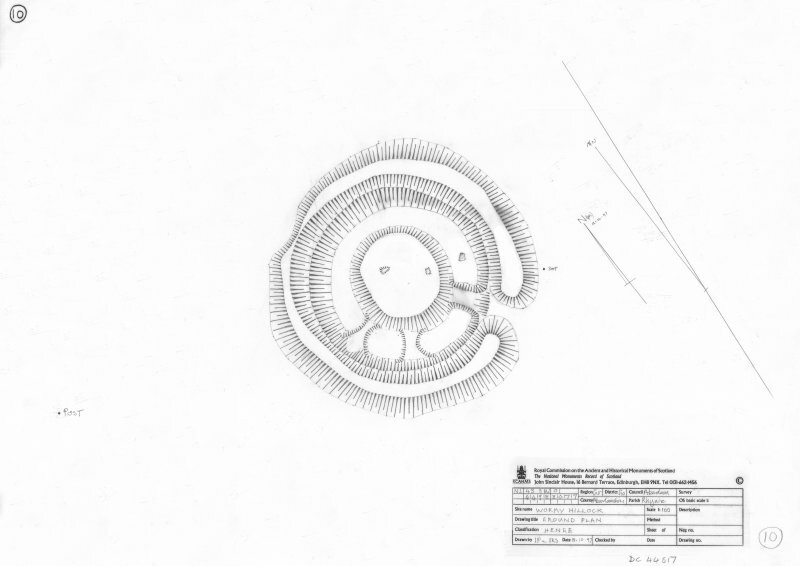 Plans of the two henge monuments at Broomend of Crichie and Wormy Hillock. together with two other enclosures with external banks at Nether Towie and Tuach Hill. 300dpi tiff copy of EPS file. Oblique aerial view centred on the remains of the henge at Wormy Hillock, looking to the NNE. 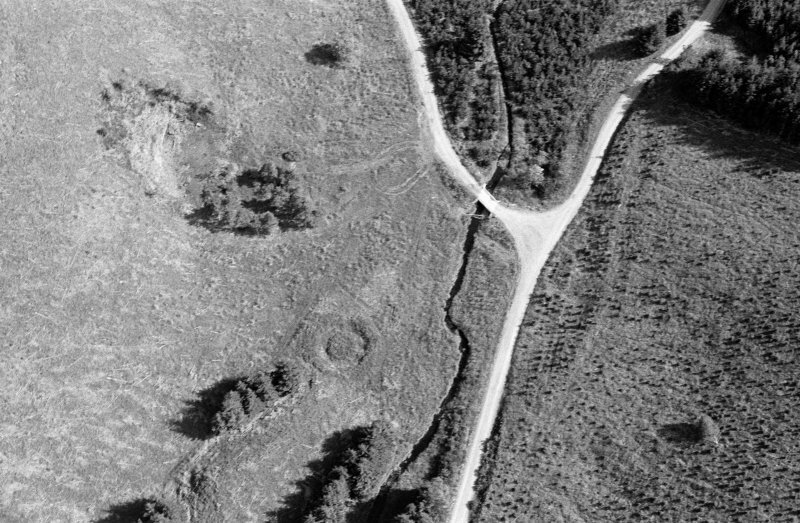 Oblique aerial view centred on the remains of the henge at Wormy Hillock, looking to the SE. 'Indeterminate remains', Clashindarroch. View from NW. Wormy Hillock a small hillock traditionally associated with a burial of a monster or snake, and once described as a 'Danish Fort'. MacDonald (1891) thought it was a 'round for sheep', dug it, but found nothing. In the ONB (1866) he suggests retaining the name but omitting any reference to 'Tumulus'. Name Book 1866; J MacDonald 1891. A well-preserved (Atkinson Class I) henge monument situated on a flat grassy haugh at the bottom of of a steep-sided valley in the Clashindarroch Forest at c.1000ft OD. It consists of a circular bank measuring 16.5m crest to crest, with an internal (probably discontinuous) ditch enclosing a circular platform 6.0m in diameter. 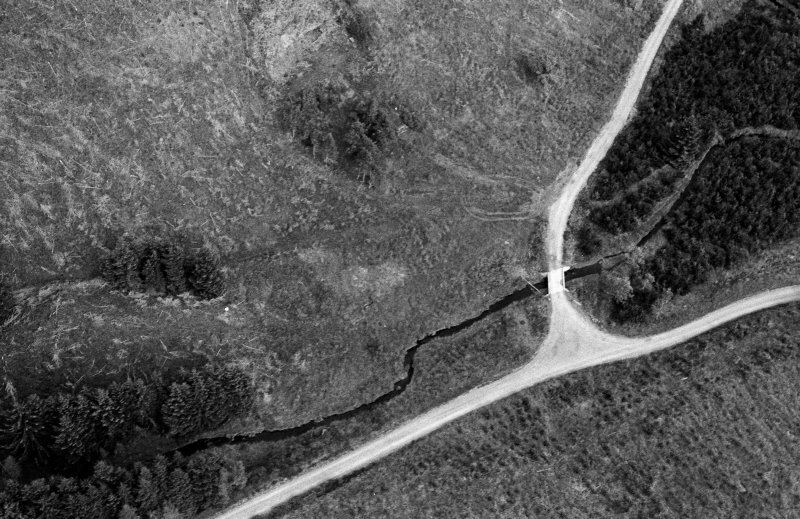 There is an entrance causeway across the SE quadrant of the ditch with a corresponding break in the outer bank. 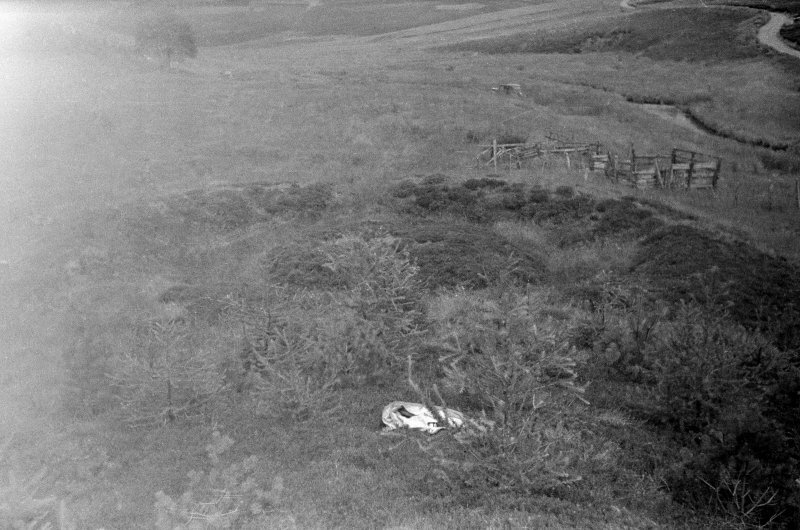 The work appears similar in all respects to the Neolithic causewayed cremation cemeteries at Dorchester, Oxon, Sites IV - VI (Atkinson, Piggott and Sandars 1951). Visited by OS (NKB) 4 February 1967. R J C Atkinson and C M Piggott and N K Sandars 1951. According to local informants Wormy Hillock applies to the small hillock immediately to the N of the henge, which is supported by the positioning of the name on the OS 1/2500 plan (information from OS (AA) 10 October 1967). However, MacDonald (1891) an acknowledged authority on place-names, clearly attributes the name to the 'sheep-round' (henge). Visited by OS (AC) 9 September 1967. This grass- and heather-grown henge is situated below the SSE end of a low, but prominent, natural mound on the left bank of the Ealaiche Burn. There is an Historic Scotland sign-plate on the SE side indicating its Scheduled status. The henge measures 13.5m in diameter from NE to SW by 13m transversely over a ditch up to 4.3m in breadth and 1m in depth. The oval interior measures 6.2m from N to S by 5.4m transversely. 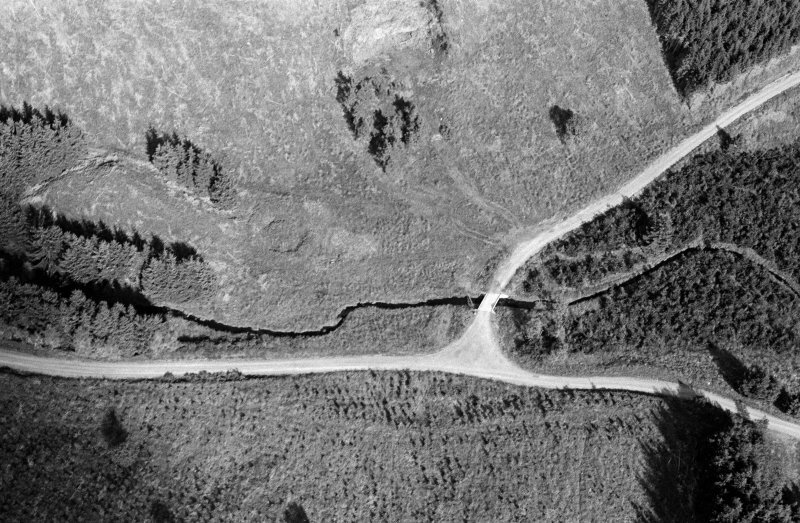 What appear to be low causeways can be seen in the bottom of the ditch, on the WSW, SW and SE respectively, that on the SE apparently linking the interior of the henge with the narrow entrance (about 1m wide) in the external bank. The bank measures a maximum of 4m in thickness and about 0.6m in height immediately SW of the entrance, narrowing to 3m in thickness and barely 0.1m in height on the NNW, where it skirts the base of the natural slope. Two small holes within the interior, one on the SE and the other 1m NW of the centre, may be of comparatively recent origin; that on the SE possibly once housed the boulder that is presently lying in the bottom of the ditch immediately below. Visited by RCAHMS (RJCM, JRS), 6 August 1996. Information from Historic Scotland, scheduling document dated 13 December 2006. 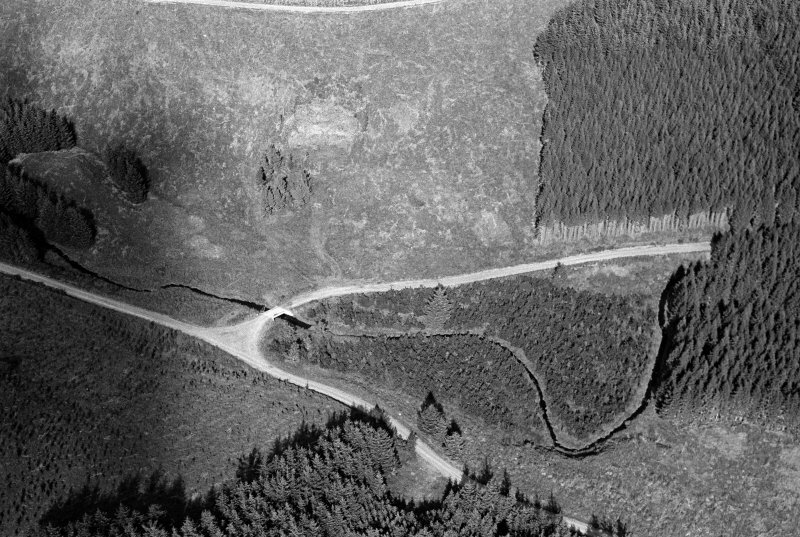 This site was recorded as part of the RCAHMS Emergency Survey, undertaken by Angus Graham and Vere Gordon Childe during World War 2. 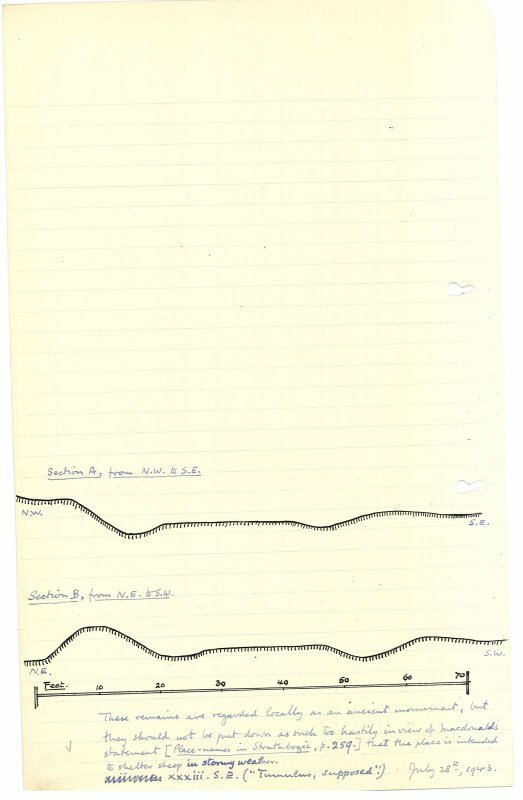 The project archive has been catalogued during 2013-2014 and the material, which includes notebooks, manuscripts, typescripts, plans and photographs, is now available online. Information from RCAHMS (GF Geddes) 2 December 2014. Although the location of this little ceremonial enclosure may seem remote to modem eyes, the gravel soils of the Rhynie area clearly attracted settlement from early times. The henge consists of a low circular bank, 16.5m in diameter, with one entrance in the south-east which gives access across the shallow ditch to the level central area, a mere 6m in diameter. The low-lying position of the henge, close to water, is typical, although few are so enclosed by the sides of a glen. Although the location of this litrle ceremonial enclosure may seem remote to modern eyes, the gravel soils of the Rhynie area clearly attracted settlement from early times. The henge consists of a low circular bank, 16.5m in diameter, with one entrance in the south-east which gives access across the shallow ditch to the level central area, a mere 6m in diameter. The low-lying position of the henge, close ro water, is typical, although few are so enclosed by the sides of a glen.